3 bedrooms, 2 bathroom cottage with privacy, a sauna and swim raft! The Sunset Lake Cottage has a beautiful view along the quiet Mud Lake, just outside of Republic, Michigan. Mud Lake is connected to Horseshoe Lake with a shallow channel. Very secluded and quiet. Mud Lake is mostly a sandy bottom beach, yet it is rocky in some parts. It is sandy around the dock where you go into the water. Please be aware it does drop to 4 ft. pretty quickly, so it isn't friendly for very young children. Its depth ranges between 10-15 feet deep, with a few spots at 20 feet. Great for fishing, privacy, and relaxation. May and June are the prime fishing time. The cottage has three-bedrooms with gorgeous views throughout. Windows surround the cabin, which makes you feel connected to nature. The Sunset Lake Cottage provides a very spacious and comfortable area, both inside and out, with plenty of space to spread out and enjoy. The screened in porch is a great feature. We even have a sauna where up to 8 people can enjoy! 3 kayaks, a rowboat and a paddle boat are included during your stay. Fun for all. Mud Lake is strictly a people-powered lake, no jet skis or water skiing allowed. You write your own script while you are here. There is satellite TV in the cabin, so there is some connection to the outside world. Cell service is still spotty in the Upper Peninsula. Internet service is being installed April 2016! Privacy: No close neighbors, though you can see the neighbors across the lake. Air-Conditioner: - No-We do not have air conditioning. Beach: While we don't have a traditional sandy beach, enjoy swimming out to the swim raft off the dock. The bottom of the lake is sandy around the dock where you go in the water. Please be aware it does drop to 4 ft. pretty quickly, so it isn't friendly for very young children. It's depth ranges between 10-15 feet deep, with a few spots at 20 feet. Boats: 3 kayaks, rowboat, paddle boat are included for you to use during your stay. Cell/Mobile Service: Cell service is spotty in the Upper Peninsula. Still, we have found that Sprint seems to provide the best service in the area. AT&T has been pretty good as well. Firewood: Please bring your own. Firewood is not provided. Fishing poles: Please bring your own fishing poles. Grill: Propane grill is provided. Grocery Store: Where is the closest grocery store? The closest, full-sized grocery store is about a 1/2 hour drive from the cabin, Ishpeming. It is the IGA Jubilee right on U.S 41. If you are driving from Wisconsin/Chicago, the last grocery store is in Iron Mountain.There is a little hardware/ convenience store in the town of Republic, about 15 minutes from the cabin, yet there isn't a large selection, and the prices are convenience-store equivalent.There is a larger convenience store/BP Gas station on the corner of U.S. 41 and MI-95, about 20 minutes North of the cabin. Heating source: Not only do we have the wood-burning fire place, yet we do have electric heat if you just need to get the chill out of the air. Linens: Yes, bed linens are provided. There is a washer/dryer at the cabin, that you can use if you would like to wash your linens during your stay. Kitchen Supplies: The basic kitchen supplies are at the cabin. Basic dishes, pots/pans, glasses, cups, etc. are provided, including basic kitchen spices. We also have a microwave, toaster, KitchenAid Mixer. blender and Pizzazz Pizza Maker. Still, we do not inventory these items, so if there is something particular you would like, we highly recommend bringing it. Pets: Pets are welcome. We love animals… but cats do not love us. Allergies require us to say NO CATS. Two well-trained dogs are fine but the house is surrounded by forest with some natural predators, so supervision is also recommended. *Pets are welcome! Freshwater Vacation Rentals currently charges $50/per pet. TV: We have cable TV in the living room. Washer & dryer: Yes-you may use during your stay. Woodstove: Yes, we have a wood stove at the property. Please bring your own wood. You can find a lot of scraps around the hills of the property. Pictured Rocks National Lakeshore: is 109 miles away ~ 2 hours and 22 minutes. Tahquamenon Falls State Park: is 177 miles away ~ 3 hours and 22 minutes. Mackinac Bridge: is 215 miles away~4 hours. *Maki's Mini Mart (Downtown) –Very limited amount of food and supplies. Beer and soda is the only guaranteed items in stock. *Hardware Store (South Republic) – Well stocked Hardware store that also sells gas. 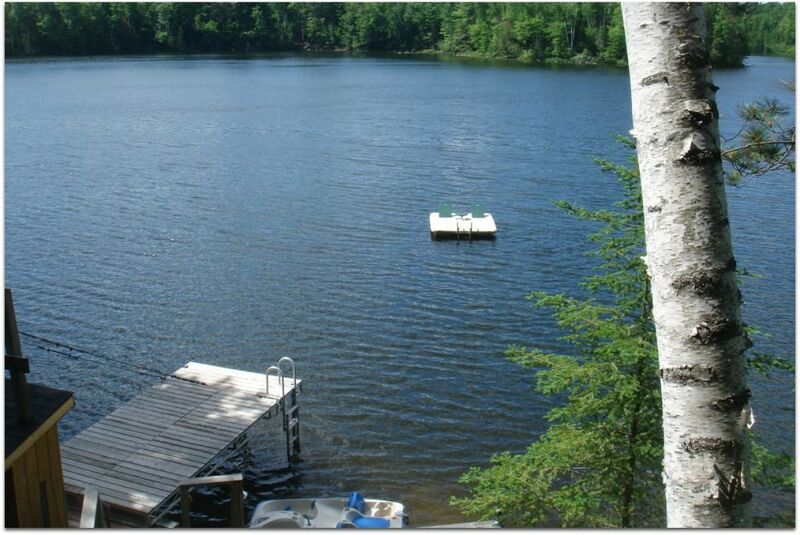 Freshwater Vacation Rentals •	Established in 2005 If you are looking for a vacation rental, you have come to the right spot! We specialize in vacation rentals throughout Michigan. From your own private island to a lodge big enough to host your family reunion or a relaxing getaway on one of the Great Lakes. If you feel like a social vacation where you have neighbors to enjoy the evening fires together, to remote places where you won't see another soul, give us a call and we'll find the right place for you. Our philosophy We work hard so you don't have to. Our goal is for guests have a wonderful vacation experience and assist our owners in maximizing their investment. We started this business 13 years ago, with the purchase of Republic Island, and added the Rapid River Lodge. We have a unique perspective, as we are both owners and property managers. We love the business and are enjoying it as it grows. Please be aware swimming area drops to 4 feet quickly. Please bring your own wood. 3 kayaks are provide for you to enjoy! Rowboat & Paddle Boat provided. The sauna easily accommodates 8 people. Very nice setting. In the middle of nowhere. With plenty to do or perfect place to just sit back and enjoy the beauty of the out doors with its large screened in porch's. Would rent again. Dawn, we love when our guests appreciate our property as much as we do. The screened in porches are pretty special. We look forward to your return stay. We enjoyed our stay. Mosquitoes were ferocious. Couldn't do anything outside the cabin without being eaten alive. The cabin is surrounded by swamp so the mosquitoes were particularly bad around the cabin. The rest of the area was beautiful. We really enjoyed ishpeming, and Marquette. The u.p. of Michigan is beautiful. Sunset House is surrounded by forest on Mud Lake which connects to Horseshoe Lake. As is true of the UP in summer, mosquitoes can be an issue. the house comes with a kayak, paddleboat and a rowboat plus dogs are welcome. It has a wonderful screened in-porch, and a sauna where up to 8 people can enjoy! The Sunset House was just what me and my family needed. Very clean, quiet, and comfortable. We loved the sauna, the screen porch, and swimming to the raft. The weather was very warm, so that was to our advantage. We hope to come back again and again. Sunset House is a special place, and the view of Mud Lake is extraordinary. Having windows all around the house makes you feel like you are out in nature, even when you are inside. The sauna for 8 people is really a fabulous addition, plus dogs are welcome! We rented this place for our extended family to all get together for our yearly get together since we all live a ways away from each other. It was wonderful! It was the best of both worlds with the house being totally secluded and on a lake with awesome amenities but having WiFi and satellite TV as well for those rainy days. We definitely made use of the paddle boat, row boat and kayaks! We bought a load of wood from their supplier and it was very fairly priced and we didn't even go through all that he dropped off. We made good use of the sauna as well. It is not the most kid friendly place with all of the steep stairs that go down to the dock and down to the lower level porch but with the kids and baby that we had there we didn't have a problem with it. We just made sure the kids knew that they couldn't go further than the first set of stairs without a parent with them. Would definitely stay there again! We are thrilled you loved your stay! And, we love that you used ALL the boats! It makes it so much more enjoyable. Thank you for all the positive comments! We love staying at the Sunset House. It is a very peaceful getaway. Depending on your interest, you can lounge in the hammock with a book, go kayaking on the lake, or enjoy a camp fire - so many things to do. Sauna is spacious and has it's own screened room - it's a lot of fun to jump in the lake after taking one. I'm so glad to hear you had a great time! You are right -- there is something for everyone at this wonderful cottage. We hope to have you back again in the future! My wife and I stayed here over New Year’s weekend. We live downstate and we chose it because it is centrally located between nearby family in Iron Mountain and Ishpeming. Rather than travelling to several places to visit, we had everyone come over there. Worked out great! The open floor plan and large kitchen were ideal for entertaining our relatives. After they left we had some time to just relax for a day or so. Talk about peaceful, I didn’t want to leave! The view, the setting, and the quiet area are all conducive to a very relaxing experience. Being right on the lake I can certainly see why people would want to stay here in the summertime, however we found it very comfortable and enjoyable in the winter also. We would definitely recommend this to anyone considering a stay. Sunset House is located in the heart of Upper Michigan on the outskirts of Republic, Michigan. The area features many lakes, trails, and outstanding natural beauty. Republic sits in the center of Upper Michigan … just off of M95. Sunset House is just 5 minutes off the highway and its a nice easy drive.